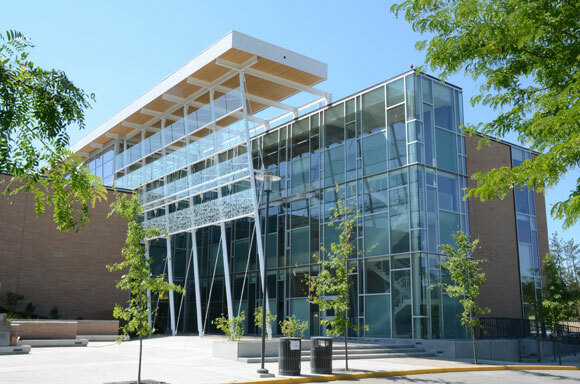 UBC Okanagan’s Reichwald Health Sciences Centre was specifically built with energy savings in mind. When fans watch the Okanagan Heat sink baskets in the UBC gymnasium, they may not be aware that energy-efficient lighting in the building is also helping the university score on its electricity bill. It’s not the only facility where UBC and FortisBC have worked together to push for energy savings. Since 2005, UBC Okanagan’s massive campus expansion projects have totalled more than $400 million in capital investment. 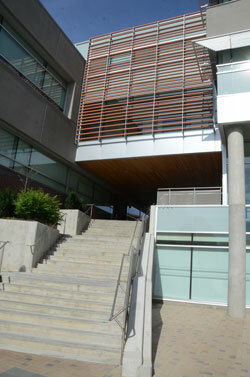 UBC Okanagan’s energy-efficient Arts and Sciences Centre. Energy efficiency programs implemented as part of expansion and upgrade projects have touched most of the Okanagan campus buildings including Arts; Arts and Sciences Centre; Engineering, Management and Education; Charles E. Fipke Centre for Innovative Research; Gymnasium; the Library; Purcell Residence; Sciences; Reichwald Health Sciences Centre; and University Centre. Through the commercial arm of its PowerSense program, FortisBC offers incentives for purchasing energy-efficient materials as part of construction and renovation projects. The benefits add up. UBC has received FortisBC rebates of more than $700,000 for electricity and gas projects since 2005. Many of these rebates were earned by choosing energy-efficient building design and equipment for new construction. Some rebates were earned by selecting energy-efficient retrofits, such as new lighting and occupancy sensors for campus buildings. Sarah Bird, a third-year student in the zoology program and chair of the Environment and Sustainability Society advocates for energy efficiency. “We are committed to working with all of our customers – big or small – to get the most out of their energy dollar,” said Dall’Antonia. The energy savings and financial savings resulting from the programs illustrate UBC’s commitment to both environmental and economic sustainability.